Pending US and EU sanctions threaten to sink Cambodia’s economy. Will China come to the rescue? In multiple and mounting ways, from aid to trade to diplomatic protection, China keeps its geopolitical ally Cambodia afloat. That patron-client relationship was on full display late last month when Cambodian Prime Minister Hun Sen made a hat-in-hand four-day state visit to Beijing. The leader came away with what he sought: More money, more promises and more comradely assurances. Beijing reportedly pledged to provide Cambodia with US$588 million in aid over the next three years, to import 400,000 tons of rice, increase bilateral trade from $5.7 billion last year to $10 billion in 2023, and broadly more investment. China’s patronage is arguably more important now than ever, as the United States (US) moves to sanction Hun Sen’s regime and the European Union (EU) looks to withdraw the country from its duty-free Everything But Arms (EBA) trade scheme. Both are punitive responses to Cambodia’s recent democratic retreat, exemplified by the dissolution of country’s main opposition party in November 2017, a move that drove many of its members into exile. Video clip depicts reality of China who can easily withdraw from Cambodia when its interests is not fruitful anymore. As most raw materials imported by China to Cambodia, the closure of garment factories in this country by the withdrawal of EU EBA and US GST, will probe China’s huge interests in its economy which has always drawn by China’s geopolitical instinct. Hun Sen’s ruling Cambodian People’s Party (CPP) thus won all the seats in the National Assembly at last July’s general election, a result many Western observers and governments saw as rigged and illegitimate. The CPP has claimed that any Western criticism of its rule is an assault on the country’s sovereignty and insult to its independence, claims the long-ruling party has played up to nationalistic effect. China, it seems, is now backing that anti-Western narrative. Its new ambassador to Cambodia, Wang Wentian, recently asserted that Western nations want to “attack the cooperation between Cambodia and China.” Geopolitical shifts partly explain why Beijing has appeared to indulge the Cambodian government’s worst anti-democratic instincts and move to a de facto one-party state after years of Western-favored multi-party democracy. Elections last year in Pakistan, Maldives and Malaysia all saw skeptics of China’s $1 trillion infrastructure-building Belt and Road Initiative (BRI) rise to democratic power. Other regional countries have also started to air misgivings or stalled on BRI-related projects. While some reports of BRI downsides and debt traps have been exaggerated, there is a rising regional backlash against Chinese investments that are perceived to erode nations’ sovereignty and finances. Xi stressed at a high-level symposium to mark the BRI’s fifth anniversary held in Beijing last August that its projects aim to “improve the global governance system” and build a world “community of shared destiny.” It’s a message China aims in particular for neighboring Southeast Asia, where big BRI plans for connecting infrastructure to promote and facilitate more regional trade are on the drawing board. However, as a small state Cambodia has limited strategic space to maneuver and its foreign policy dynamics face considerable challenges . The country is seen to lean toward China, its closest ally and its largest economic and military benefactor, at the expense of good relations with other countries. Cambodia’s close embrace of China has become more evident since 2012. From blocking ASEAN joint statements to supporting Beijing’s One China policy, Cambodia continues to demonstrate its willingness to embrace China. 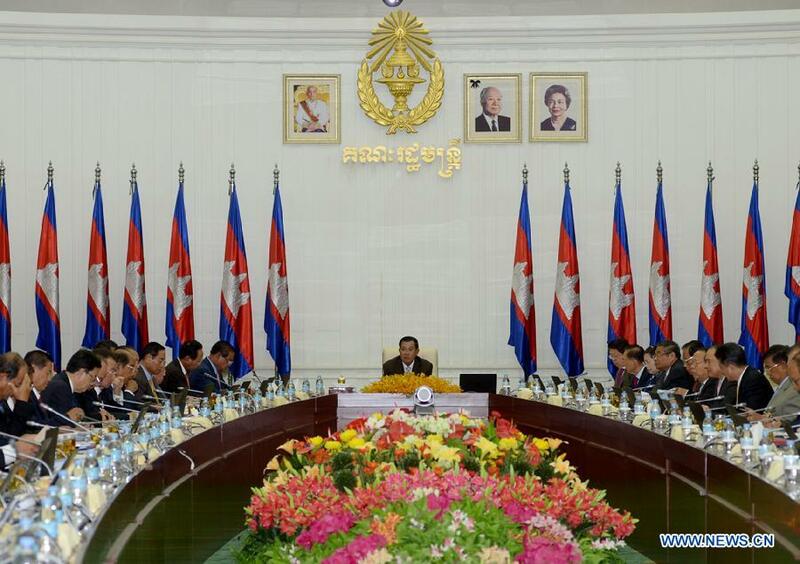 In turn, China has reciprocated through increasing “no strings attached” aid and loans to Cambodia. Both countries upgraded their relations to a comprehensive strategic partnership in 2010, and as of now China is Cambodia’s largest foreign direct investor. The trade volume between the two countries was valued at $5.8 billion in 2017, by which time China had given approximately $4.2 billion to Cambodia in the form of aid and soft loans. While Cambodia is seen to enjoy its reciprocal relationship with the world’s second largest economy, its relations with the West look set to deteriorate. Following the dissolution of the opposition Cambodian National Rescue Party (CNRP) in 2017 and the controversial national election in 2018, which saw the ruling party sweep all seats in the National Assembly, Cambodia’s ties with the United States reached a new low. The United States has imposed visa sanctions on high-ranking Cambodian government officials, withdrawn aid commitments, and further imposed financial sanctions, including asset freezes on the commander of Prime Minister Hun Sen’s bodyguard unit. The Cambodian ruling elites have condemned these sanctions and have repeatedly made reference to the U.S. bombing of Cambodia during the Vietnam War, rhetoric Hun Sen’s government has often used to criticize the US. Cambodia’s ties with the European Union now also face challenges. 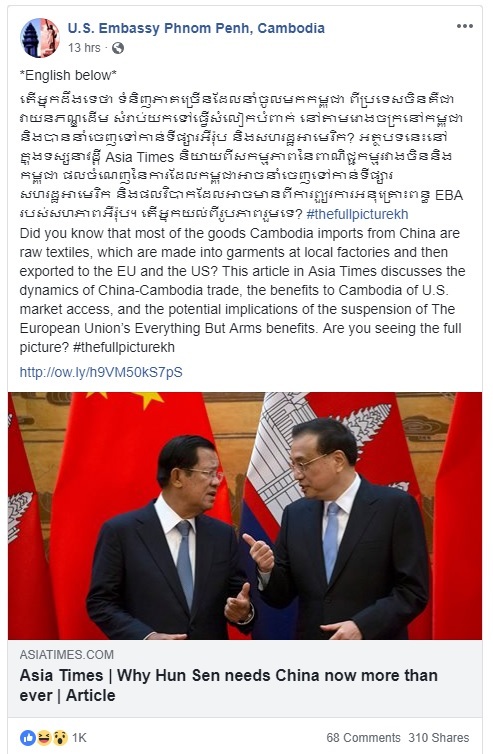 The EU has begun the internal process to withdraw its Everything But Arms (EBA) trade preferences from Cambodia, a move the European bloc initiated in response to the Cambodia government’s perceived lack of commitment to improve its human, labor, and political rights situation. In return, Cambodia issued a communiqué calling the EU trade threat an extreme injustice. The EU has been also accused of using double standards in its treatment of Cambodia. Further, Prime Minister Hun Sen has recently warned that he would put an end to the opposition party if the EU withdraws the EBA from Cambodia. Cambodia’s foreign policy toward the United States and the EU, analyzed in terms of recent developments, appears not to be heading in the right direction. It is not wise for Cambodia, as a small developing country, to fight against or alienate itself from the world’s largest economy and the world’s largest trading bloc. Although the Cambodian government may have strong support from China, its current approach toward the United States and the EU will not be helpful in the long run. It is certainly better to have friends on both sides of the world, rather than adopt a one-sided orientation toward friendship and foreign policy. Hun Sen and his ruling elites’ powerful narratives of war, peace, development, poverty reduction, independence, and sovereignty are well developed and seem to be well received by many Cambodians who have first- or even second-hand experience of the atrocities of the Khmer Rouge. Most Cambodians, if not all, would not like to experience or hear about war or social instability again at all. However, they also expect more from their country and leaders. In addition to peace and stability, they have a strong desire for better opportunities, freedom, and human rights. They want to see many social issues being addressed. While they are hopeful for the future of Cambodia, they may also be worried about a possible worst-case scenario where their country may fall victim to a new cold war in Southeast Asia. Specifically, it is conceivable that Cambodia may become an object of strategies used by China and the United States in their competition for dominance in the international system and in Southeast Asia in particular. Cambodia’s close alignment with China, although important for Cambodia’s economic development and the ruling elites’ legitimacy, does not seem to bring about sustainable and inclusive development for all. Chinese investment, aid, and loans are generally directed at the government and the Cambodian elites. 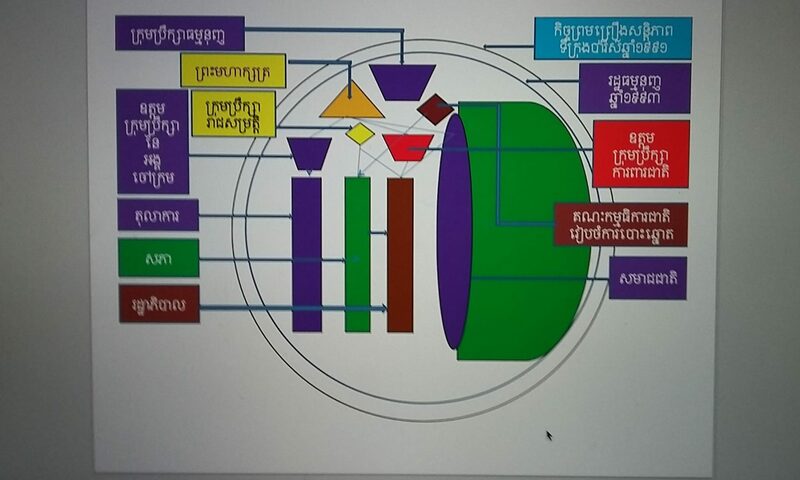 Unlike the Chinese way, the Western approach to aid, loans, and investment projects is usually channelled through non-governmental organizations (NGOs) and aimed at benefiting ordinary Cambodians. Although the number and amount of aid and development projects from the West are few, when compared with a large and increasing number of the Chinese investment projects, they are usually seen to promote accountability, sustainability, and inclusiveness. Chinese investment projects, however, tend to lack transparency and accountability, leading to many environmental and social issues in Cambodia. Thus, the impact of China’s development projects on the sustainable development of Cambodia is still an open question.